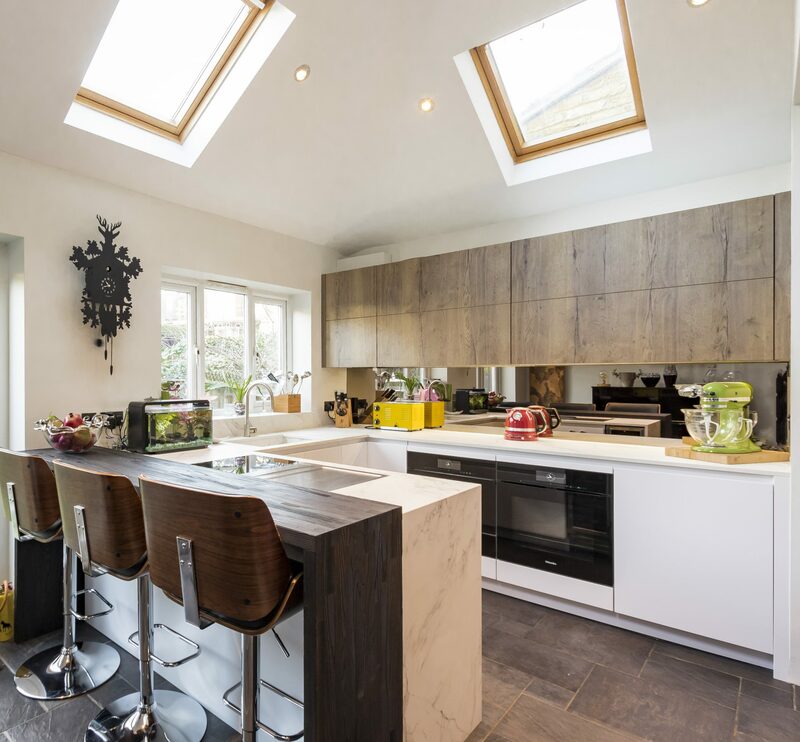 View our latest projects in Teddington, what kitchen, appliances and accessories brands have been used to create those amazing designs, you can also view customers reviews on these designs. Sleek and minimalist Kitchen featuring glossy Alpine White units, a stainless steel Rangemaster Range Cooker and an elegant breakfast bar. Appliances: Stainless steel Rangemaster Range Cooker and Extractor, integrated Fridge-Freezer. This elegant and minimalistic Kitchen design has been achieved by mixing and matching different elements, all in a white-on-white colour scheme. The handleless, glossy white cabinetry—NOBILIA Lacquer, Alpine White High Gloss—is completely free of adornment and helps to define the bold and minimalistic look. 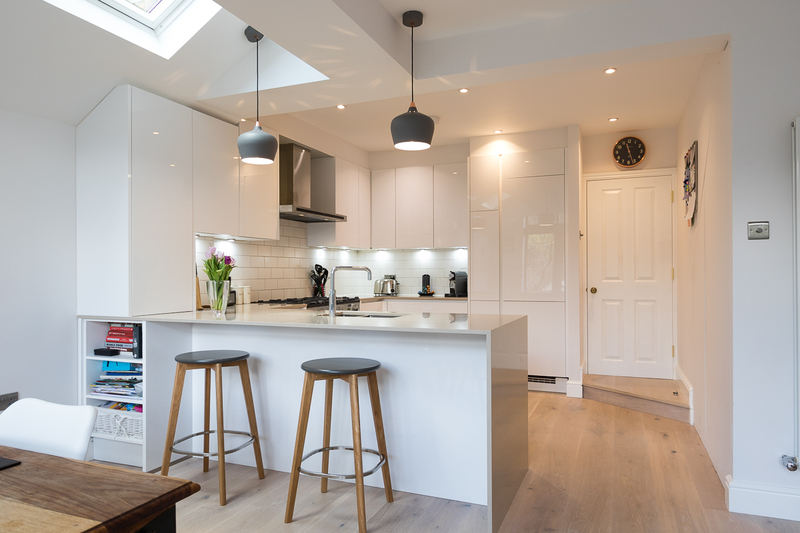 The all-in-white colour scheme allows light to flood into the Kitchen, keeping it modern and fresh. The streamlined design has been enhanced by the lack of door handles and the use of materials in continuous white (cabinetry, worktop and tiles), even the Fridge-Freezer is concealed behind glossy white fronts.  However, the breakup of a solid run of white happens when a contrasting visual element is added in the design. Here, the Rangemaster Range Cooker, in cool stainless steel, works as a strong focal point, complementing, defining this working area and adding a touch of industrial chic to the design. Storage is elegant and abundant. There are numerous wall and base units, as well as handy and extra-wide pull-outs, a larder and a stylish open shelves lower unit by the breakfast-bar. To keep the streamlined look and enhance symmetry, the breakfast-bar stools match the number of pendants and replicate the same colour finish. To finalise the look, LED lights have been cleverly installed underneath the wall units, adding an instant uplift and excitement to this modern and vibrant space. Another successful project completed by Richmond Kitchens. Here is a Kitchen which has skilfully combined different materials and innovative technology ideas to create a space filled with contemporary excitement, sophistication and outstanding versatility. An amazing U-Shaped Kitchen where the word ‘streamline’ reaches a whole new level. A Kitchen that is daring, individual and inspiring, where every detail has been nurtured and every possibility considered and counted for. The cabinets are from the German manufacture Leicht. The Arctic white matt fronts from the base units contrasts well with the Limes Oak from the wall units. The all white base units bring in freshness and brightness, while the oak effect colours add warmth and natural elegance to the area. The Mirror Bronze splashback works in perfect harmony, blending into the colour scheme, but nonetheless shining through. Complementing the white base units still, the worktop of choice, the super-hardwearing Dekton Aura 15, adds practicality as well as superb looks. The distinctive veining creates a very individual and organic flow, bringing in a unique character to the design. The Breakfast Bar area is outlined by the raised hardwood wrap around incorporated to the back of the base units where the integrated cooktop sits. Two very different elements, wood and composite, have been used here, creating a strong visual contrast and defining preparation and serving areas. The Breakfast Bar is a bespoke feature crafted in the stylish hardwood Spekva, Brasilica River Washed being the chosen finish, and is undoubtedly a focal point in itself. The cooktop of choice for this project is the Bora Professional Revolution 2.0. It comprises an induction hob, a Tepan-stainless steel grill and an extractor all together. It sits flush with the worktop and offers simplicity, functionality and excellent performance. The intelligent control knobs allow for everything from power control and function programmes to temperature indication. In a modern Kitchen design, everything is planned for and no space is ever wasted. The wine cooler is cleverly positioned close to the Breakfast Bar and allows nice and cool beverages to be within arm’s reach. Also, the change in material helps to draw attention to this trendy Kitchen appliance, a discreet mark of modern elegance. The Multiple ovens are black, handleless and built in. They consist of a Miele Steam Oven ArtLine M-Touch, a Miele Oven ArtLine M-Touch and a Miele Warming Drawer. The simple and smooth pattern follows along the worktop all the way across. The sink is bespoke and beautifully paired up with the high-quality Franke Fuji Tap with pull out nozzle. To maximise space and enhance the streamlined design, tall integrated units have been installed to accommodate a full-size fridge and freezer, as well as clever and plentiful storage units. Such as the tall Leicht Pocked Door unit, where sleek and sturdy doors in Limes Oak finish can effortlessly slide in, allowing for this particular working area to be at full display or concealed, depending on one’s needs. The interior design of these units is equally important. So, inside, there are different functional elements, able to accommodate big and small items, as well as many internal drawers. These drawers are equipped with soft close mechanisms. All these clever accessories add to the overall practicality and efficiency of the whole Kitchen. Another interesting feature is the Servo Drive Opening for the fridge and freezer doors. It’s an electrical opening support system where motion technology allows for supreme opening ease. A single touch is all that is needed, and the fridge or freezer seem to open by themselves. They close again softly and effortlessly. Another successful project completed by Richmond Kitchens. Kitchen Design by Mehdi Sakhri.